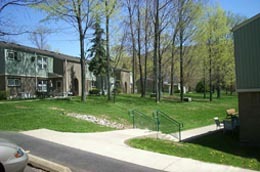 We maintain one development in Clarks Summit (Chinchilla), it is referred to as Cole Village. It is located off Layton Rd. which is off the main road through the business district of Clarks Summit. This site is solely for senior citizens. There are zero (studio apts.) and one bedroom units. It is beautifully laid out amidst the trees and off any busy thoroughfares. Transportation is needed to get to any retail outlets, pharmacies, or grocery stores. This site is about 3 miles from Scranton, and has entrance ramps for 81 and the PA Turnpike just a mile away.